Exotic recipes are lovely, but sometimes I yearn – or only have time – for a simple dinner. 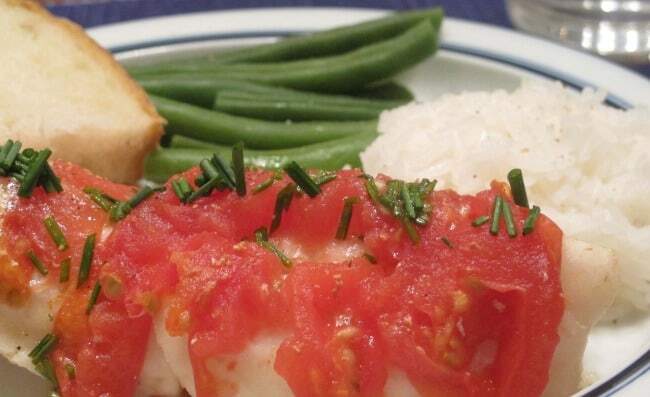 When I’m in that mood, fish filets poached on the stovetop definitely fit the bill. You can prepare them in a flash, and yet the finished product looks and tastes like a “real” dinner meal. 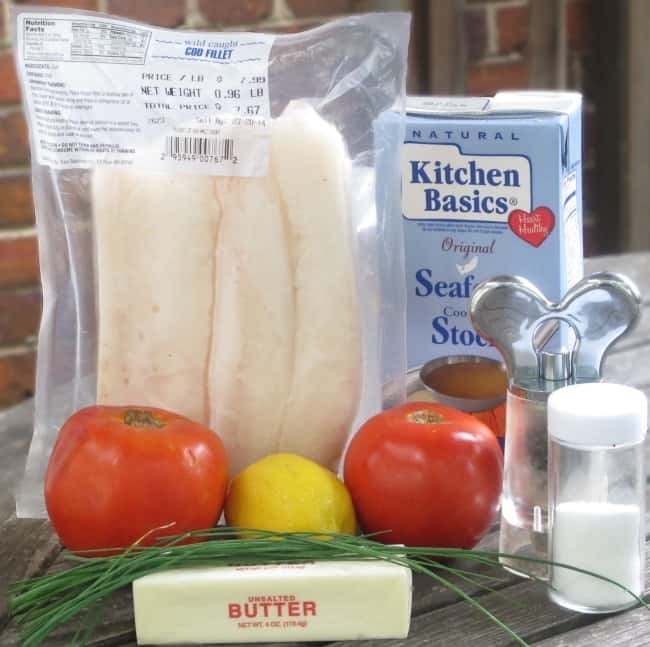 The recipe below calls for cod, but you can substitute any other thick white fish such as scrod, haddock, or pollock. 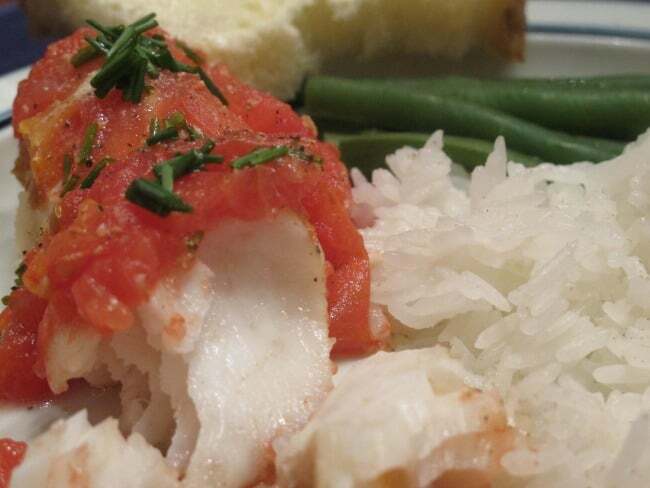 Although I love fresh fish, I found frozen wild-caught cod filets and was anxious to try them. I do cook and eat farm-raised fish and seafood, but prefer wild caught. Both Whole Foods and Trader Joe’s carry wild-caught frozen cod filets that are flash frozen and vacuum-packed; I bought this batch at Whole Foods. The price was reasonable and the quality was good. 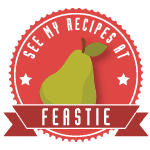 This recipe is more of a base formula than an exact recitation of ingredients and amounts. There are lots of ways to go with the poaching liquid – water, milk, white wine, or my choice in this case, a seafood stock. 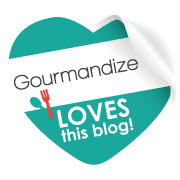 If I have leftover white wine, I’ll often use a combination of wine and water or wine and vegetable, fish, or seafood stock/broth. If you open a box or can of stock or broth for this recipe, don’t forget to use my tip for saving the leftovers. By the way, the difference between them is that stock is generally made without seasoning (to be seasoned later, in whatever dish you use it in), whereas broth has already been seasoned. You can use either one for this dish; just add fewer seasonings if using broth. Place the filets in the pan. Add liquid almost to cover the filets, and then top them with tomato slices. (If you have the time and prefer a pristine look for the finished dish, peel the tomatoes and remove at least some of the seeds.) The tomatoes provide flavor (as well as color contrast), so use the best ones you can find. Seconds from the farmers market work because you can cut away any bad spots. Bring the liquid to a low boil, cover, turn down the heat and simmer for 3-6 minutes (depending on the thickness of the filets) until the fish flakes when prodded with a fork. While the fish is cooking, melt the butter in the saucepan or ramekin. Then add up to a tablespoon of lemon juice and slat and pepper to taste. Set aside. When the fish is done, gently lift the filets out of the liquid with the spatula. Top with a bit of the butter and lemon juice mixture and the chopped parsley or chives. Serve with rice and a salad or green vegetable.